US officials called an Egyptian report that Secretary of State John Kerry met with senior PA official Saeb Erekat before the vote on last week's anti-Israel UN Security Council resolution to coordinate official positions on the resolution "a total fabrication." “Claims cited in your piece are wrong. No such meeting took place,” State Department spokesman John Kirby tweeted to The Times of Israel Wednesday in response to its story on the Egyptian report. PA officials also called the report a fabrication. 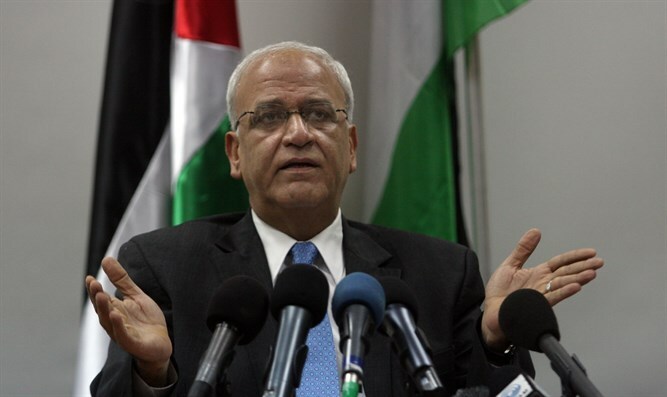 PA Chief Negotiator Saeb Erekat called the report “lies and half-truths” meant to serve Prime Minister Binyamin Netanyahu and Defense Minister Avigdor Liberman. According to the report by Al-Youm Al-Sabea, the Egyptian news site had obtained a transcript of the meeting between Kerry and the PA official in which Kerry offered to cooperate with the PA at the Security Council. Israeli officials have accused the US of working behind the scenes to pass and even draft the anti-Israel resolution last week which declared all Jewish presence of the 1949 armistice lines to illegal.